Gurcharan Das ambassador of School Choice Campaign: Fund Students, Not Schools! Gurcharan Das is an author, consultant and public intellectual. He is the author of the international bestseller, India Unbound, which has been published in many countries and languages and filmed by the BBC. He writes a regular column on Sundays for the Times of India, Dainik Bhaskar, Eenadu, and Prabhat Kabar and occasional guest columns for the Wall Street Journal, Financial Times, and Foreign Affairs, Time and Newsweek magazines.Gurcharan Das graduated with honors from Harvard University in Philosophy and Politics. He later attended Harvard Business School (AMP), where he is featured in three case studies. Penguin has published his novel, A Fine Family, which is being made into a film. Oxford University Press has published his anthology, Three English Plays, consisting of Larins Sahib, a prize-winning play about the British in India, which was presented at the Edinburgh Festival and other cities. Mira, another play, was produced off-Broadway to critical acclaim from New York critics. 9 Jakhoo Hill has had a successful run in major Indian cities. Penguin has recently published his book of essays called The Elephant Paradigm. He was CEO of Procter & Gamble India and Vice President, Procter & Gamble Far East between 1985 and 1992, and later Vice President and Managing Director, Procter & Gamble Worldwide (Strategic Planning). 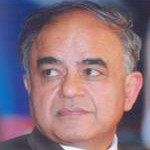 Prior to P&G, he was Chairman and Managing Director of Richardson Hindustan Limited from 1981 to 1985, the company where he started as a trainee. In 1995, after a 30-year career in 6 countries, he took early retirement to become a full time writer. He currently consults with a number of companies on global corporate strategy, and is associated with a private equity fund. He has served on the juries of the McKinsey award for the best Harvard Review Article (2005) and $500,000 Milton Friedman prize (2004). He has two children and he lives in New Delhi.